Submitted by a_warming_trend on February 19, 2015 – 11:08am. A few weeks ago, I mentioned to a coworker that I was interested in acquiring spent grains from local breweries. 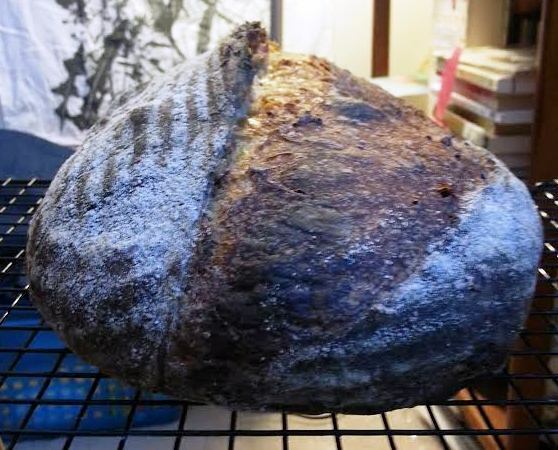 I’d read a few different sources on baking with spent grains, and a few were sort of intimidating (my apartment is tiny, so I don’t know where I’d lay them out to dry! ), but some just described dumping them in with the dough. Appealing to my experimental spirit. A few days later, she appeared in my doorway with a plastic bag full of wet spent grains from Big Boss Brewing Company right here in Raleigh, North Carolina. 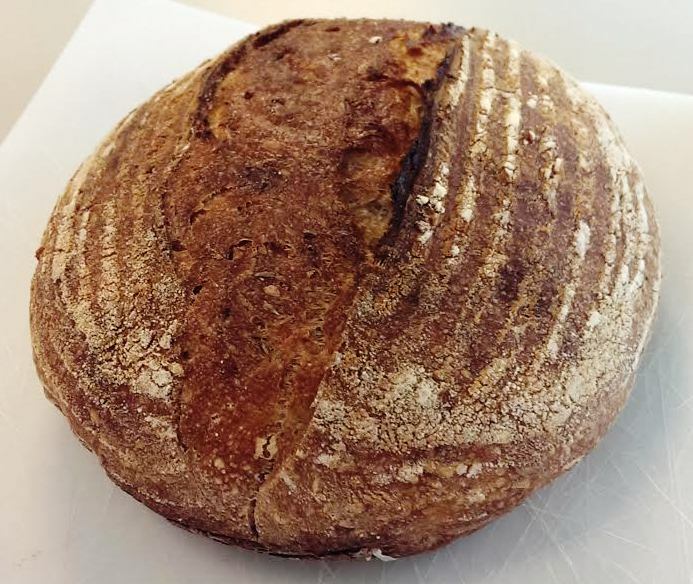 As I pondered my bag of wet grains, it occurred to me: What if I used one of the brewery’s beers as well as the brewery’s spent grains…in a single bread? Take One: For my first attempt, I autolysed 475 g AP flour with 355 g (one bottle) Brown Betty Brown Ale, and 20 g water, and autolysed for 8 hours. 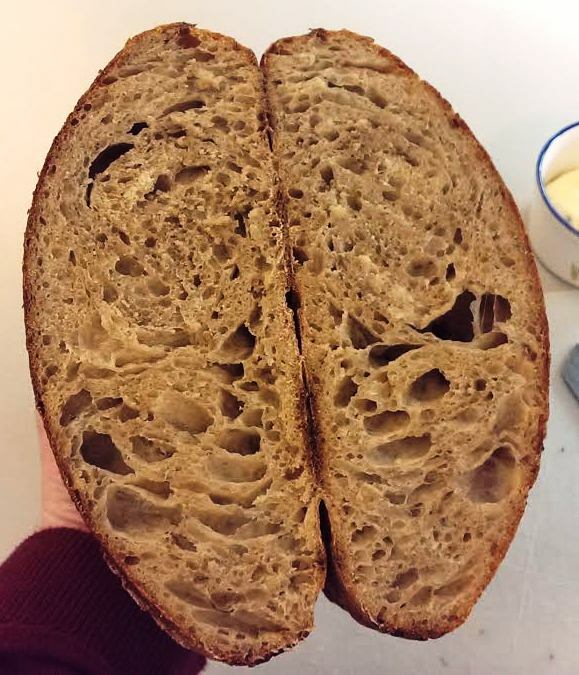 I then kneaded in 50 grams of 100% hydration white starter, 11 g salt, 5 g diastatic malt, and 60 g spent grains. I stretched and folded every 30 minutes for 2 hours. The mixture fermented at room temperature for 12 more hours, and was about 80% risen at that stage. I then refrigerated the dough for about 12 hours. Then, I had the bright idea to try to do a cold proof on top of that cold bulk. 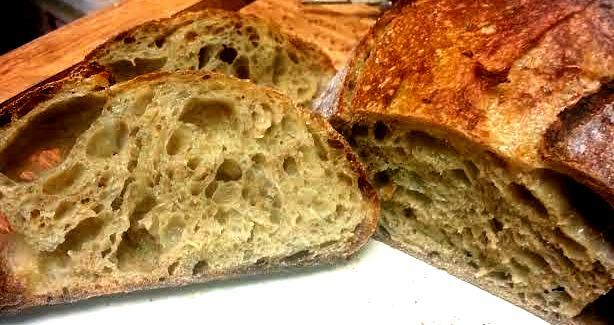 I shaped the batard and let it proof in the fridge for 12 hours. Even with 1.5 hours at room temperature, I had a funny feeling about this one. I had to bake it off, though (475, 20 minutes with steam, 25 without), and get to work! Sure enough, the ovenspring wasn’t great. Definitely underproofed. I broke one of the most important rules of bread-baking. I listened to my own internal clock, rather than the dough! Take Two: Along with sticking to just ONE cold rising stage, I knew I wanted to also increase the amount of spent grains, and also work in some whole wheat. 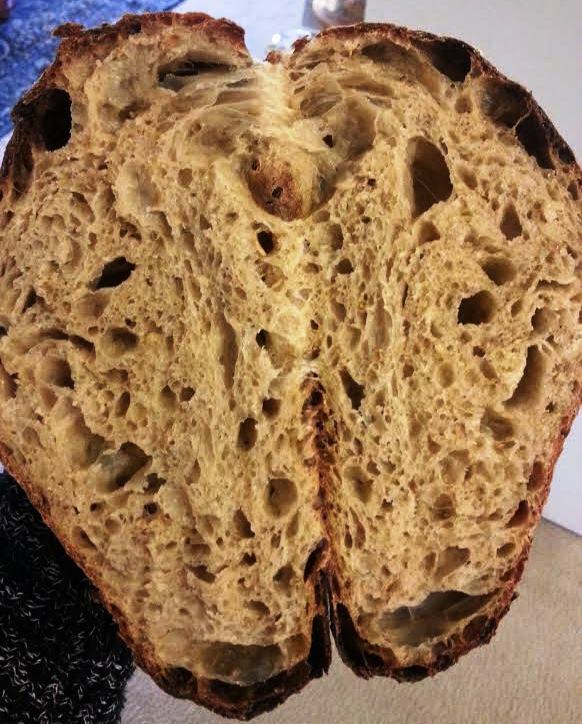 This one was the same as the previous loaf, except that I replaced 50 g of AP flour with whole wheat and upped the spent grains to 80 g. Same 14 hrs of room temperature bulk, then retarded for 24 hours in the fridge. Shaped and proofed for 1.5 hours. Baked at the same temp as the previous loaf, for the same amount of time. Better! Better flavor…more noticeable earthiness from the spent grains. But…still not there. Take Three: The one I’ll settle on for awhile. 1) Autolyse flour and beer for 8-10 hours. 2) Mix in the rest of the ingredients. Some sources have suggested holding out on incorporating the spent grains due to the sharpness of the edges, but I don’t mind making them one with the gluten network right after the long autolyse. 3) Slap and fold for 4 minutes. 4) Stretch and fold every 30 minutes for 3 hours, anywhere from 1-4 turns (4-16 folds). 5) Allow to ferment for 10-13 hours more (until roughly doubled). 6) Place dough in the refrigerator for 12-48 hours (Mine was in for 36). 7) Divide and rest for 10 minutes. 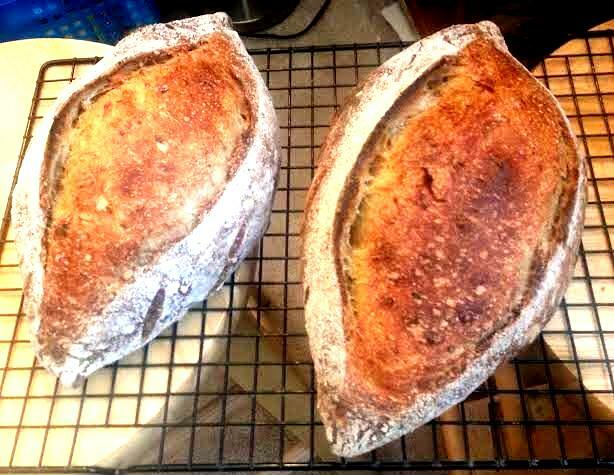 Shape into torpedo batards. 8) Proof for 1 hour at room temp, and transfer to freezer for 20 minutes (freezer trick, freezer trick!). 9) Score and bake at 475 for 14 minutes with steam, 16 minutes without. I really like this bread. The addition of whole wheat and brown sugar just brings out the maltiness of the brown ale. I didn’t originally think that brown ale would be a great baking beer, because it’s less intense than a porter or an IPA…but I ended up really liking the subtle nuttiness. 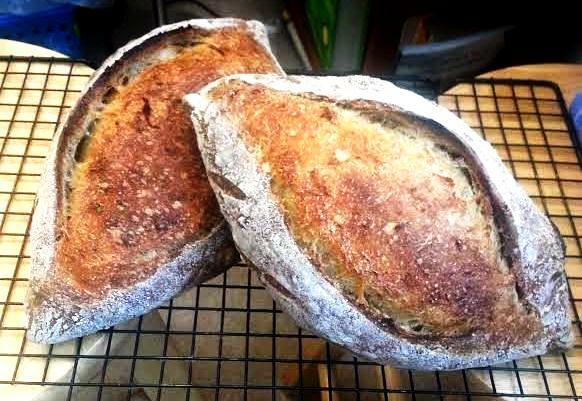 I’m looking forward to having this bread with a range of winter soups. 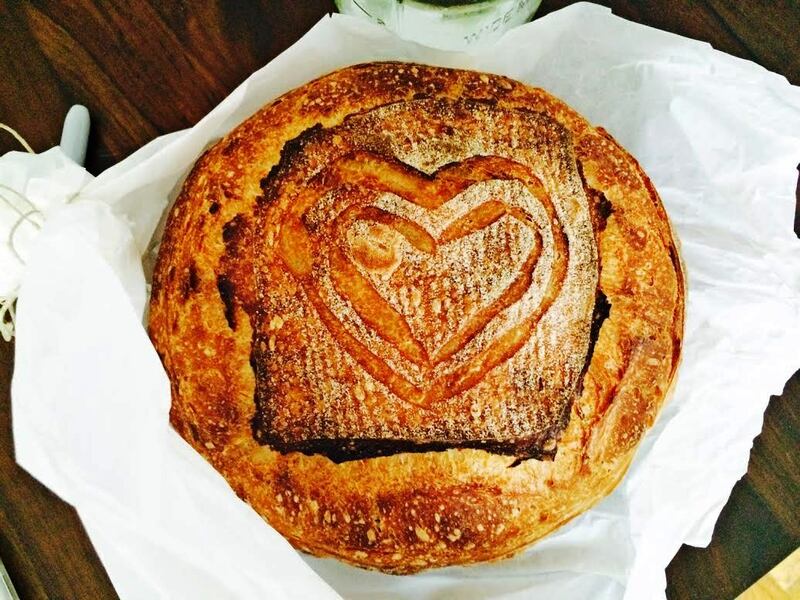 Bonus photo of one more heart-scored pain au levain from the weekend.